This pond garden was inspired by Shigemori’s innovative approach to traditional Japanese garden design, using reclaimed natural and manmade materials to create dramatic geometric designs and contrasts. This composition welcomes a variety of viewpoints, as diagonals lead the eye between the planting and smaller rocks on the left and the dominant rock group and waterfall on the right. Materials were chosen for both textural contrast and environmental concerns. The pond bottom and border are fabricated from reclaimed Corian countertop remnants. Cedarwood essential oil is added to the porous rocks to echo the visual effect of the cedar base, made from surplus closet lining. Motion and sound from the miniature waterfall complete the sensory experience. *Tschumi, C. (2005). 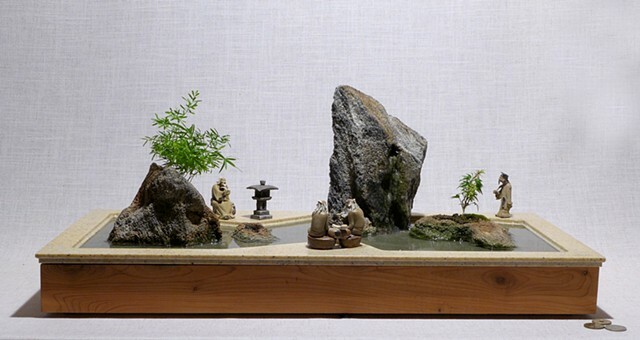 Mirei Shigemori: Modernizing the Japanese Garden. Berkeley: Stone Bridge Press. 26" x 13" x 15"